I've been working on the electrical system for the last week. Moving slowly in order to make sure I think through everything correctly. Electrical work isn't hard, it is just methodical and detail oriented. You can't swap wires or use the wrong size wire or wrong crimp and you've got to keep that straight for every run of every circuit. Add to that tired, sore fingers and hands as every crimp itself is a process of unsheath, strip, twist, insert, crimp, pull check, and heat shrink... seemingly hundreds of times over. Wading through the endless series of different size crimped ends is enough, but then you have to calculate for voltage drop over X distance with Z gauge wire (twice over, once for positive and once for negative) in order to properly size your wires. 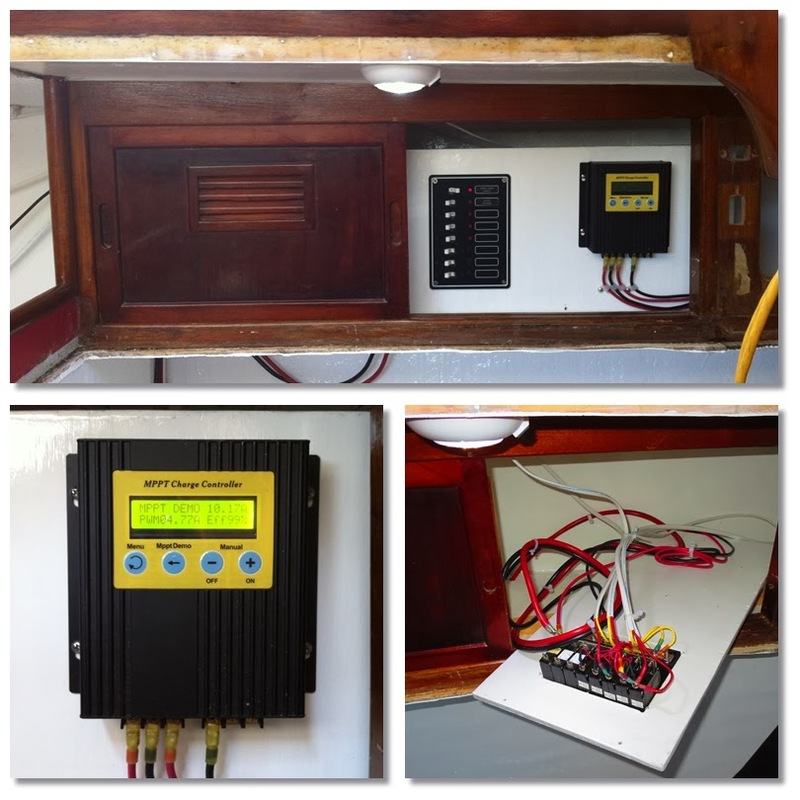 You must know the power demands of every electrical object on your boat and the distance (by hidden wire) from the battery. And with a project like ours, where everything has been gutted, filled and rebuilt, you also have to decide the routes all the wires are going to take in order to get where they are headed. So we started the project with the cabin lighting. Sarah and I had selected inexpensive SeaSense LED light fixtures throughout the cabin. All are equipped with red or white LEDs at the flip of a three way switch, and impressively, all of them were under $30 each, the small white plastic ones were under $10, and they all pull less than 1/5 of an amp, allowing us to use Ancor Marine's most minuscule 18 gauge white sheathed duplex wiring. My father had already installed the main battery cables and house power panel when we were here in December, so it was just a matter of breaking out the circuits from there. We decided a bus bar should go in the closet to feed the three nearby lights in the main salon, head, and V berth. Also, since the mast wiring also passes through the cabin ceiling "behind" (fore of) the wooden arch, we installed the mast wiring bus block on the top of the closet as well. 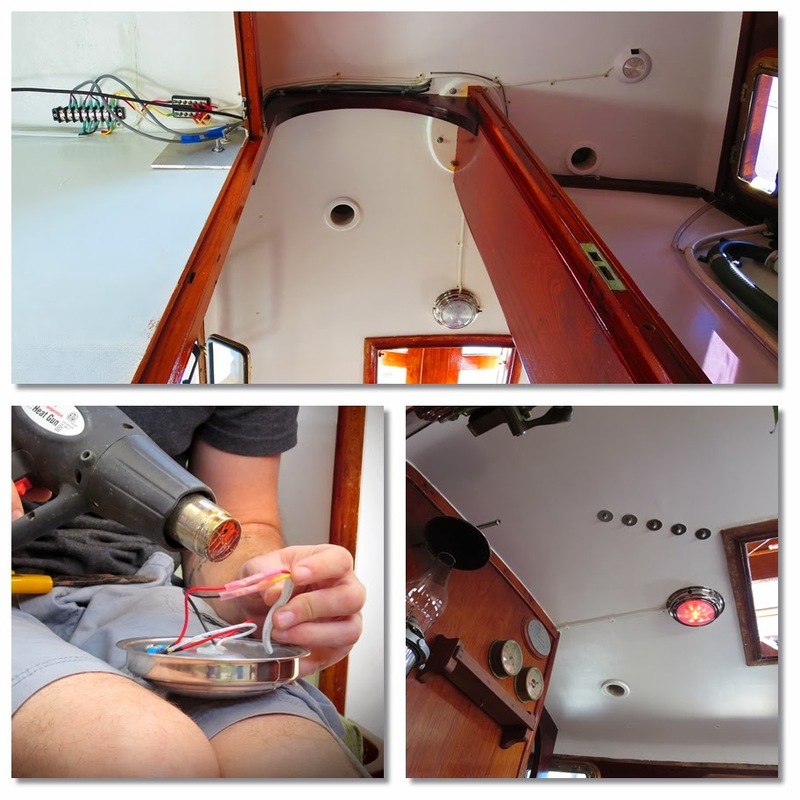 We ran all of it tight to the ceiling with wires in descending color: black coax antenna cable, then gray triplex for the masthead and foredeck, and white duplex wires for the spreaders and cabin light; all hidden from the main salon. Only the lonely wind speed transmitter signal cable, which is a tiny gray cable, is taking the route through the head. Since we were now taking power from the batteries, I thought it best to start giving back. I finished the adjustable solar panel installation that I've had floating around in my head for the last couple years. When installing solar panels, make sure to keep them covered until everything is wired. You do not want to connect panels under solar load, nor leave them as an open circuit under solar load, so I just cut out some cardboard and taped it to the panel faces during installation. It also allowed me to flip them upside down to drill the frames without worry of cracking or scratching the glass underneath. First I drilled and screwed two cross bars of 3/4" square extruded aluminum square tube (like you would get at most hardware stores) into the back of the extruded aluminum channel frame of the solar panels. Then I attached them to the boat using U-bolts around my aft pulpit railing and drilled through the cross bars I had screwed to the panel frame allowing the panels to fold down or out like wings. Use nyloc nuts or lots of threadlocker throughout. My solar panels came with nice TUV-rated waterproof outdoor connectors already installed. 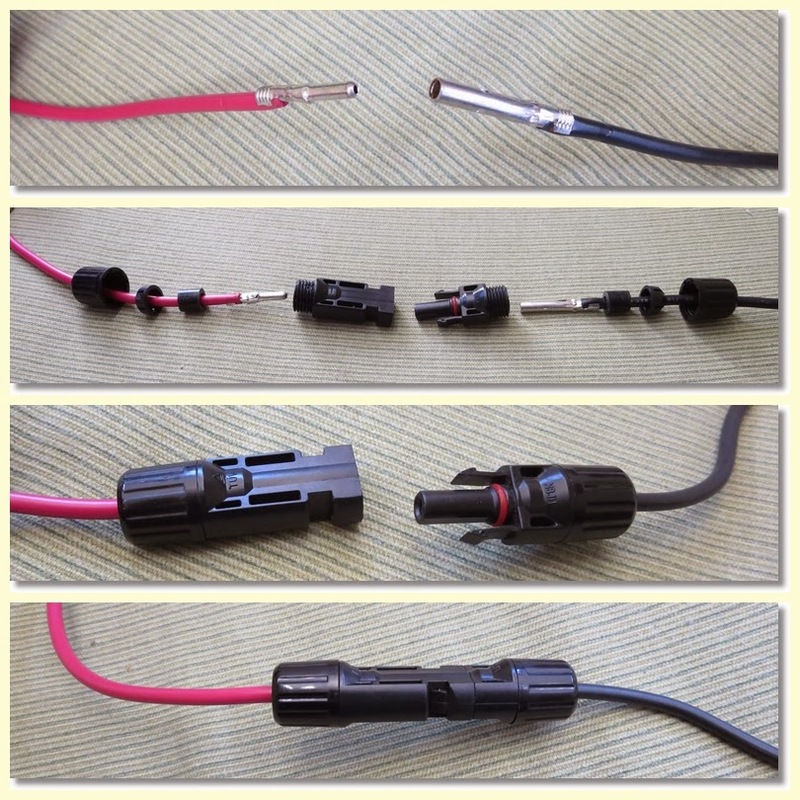 I had never seen them before, but a google search revealed they are called MC4 connectors, and there are some sellers on ebay and amazon who sell sets of five do-it-yourself crimp-on MC4 connectors relatively cheap. The resulting connection is electrically sound and fully waterproof. 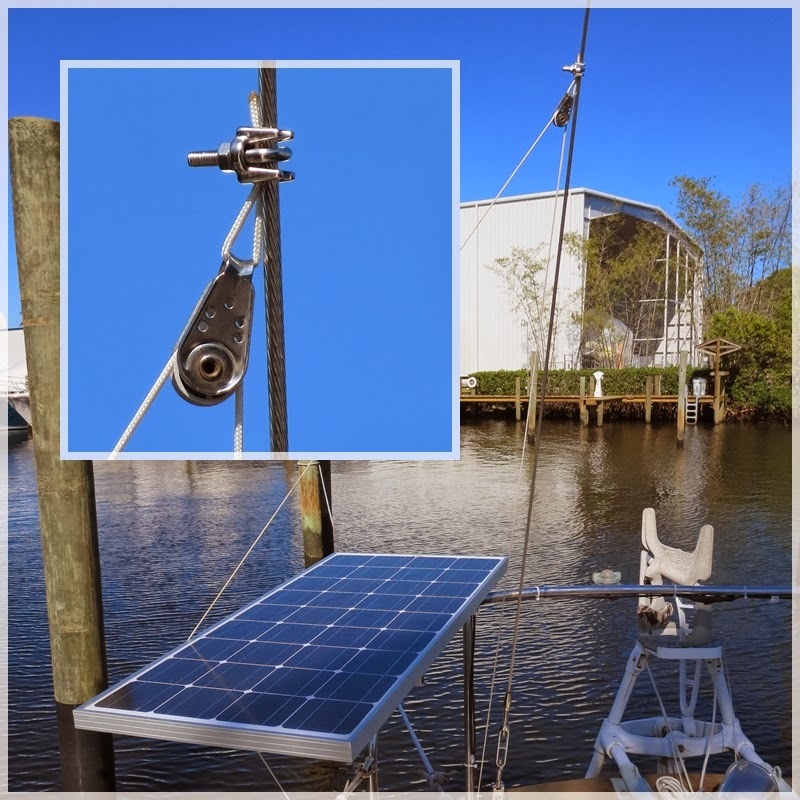 Now we can easily unbolt and disconnect the solar panels if we really need to keep them safe. Next I needed a way to keep the solar "wings" towards the sun and keep them from flapping. Some linear core Dacron cord, cable clamps, and a couple spare mini blocks from my boxes of project spares, and we've got a solution. I've always hated those huge red "1-Both-2" battery combiner switches, and I've heard that they have been the cause of all sorts of mistakes like running an expensive set of house batteries into the dirt trying to start an engine when you didn't know it was on "2" instead of "1" or vice-versa or leaving it on "both" after shutting off the engine and forgetting you've got a bum starter battery sucking your house dry... or vice-versa. Plus the only reason for the big ugly red switch is to combine the batteries during charging, or to switch from one battery to the other in an emergency, but it means switching it every time you start or stop the engine and every time the sun comes up or sets if you want to be vigilant about battery charging and protection. 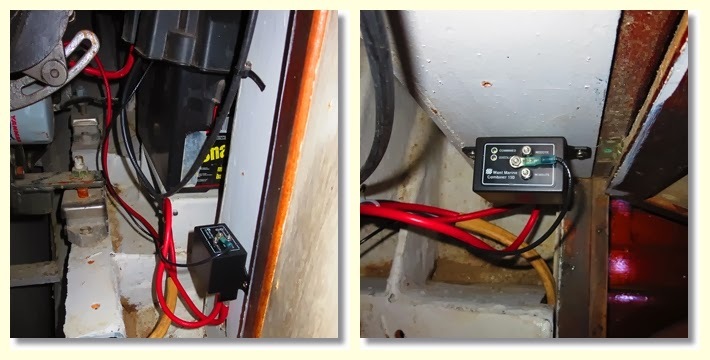 I figured the only emergencies that required swapping power sources were using the starter battery to run the bilge pumps and using the house batteries to start the engine in a pinch. Enter the remote, voltage-sensing battery combiner. Essentially just a large high voltage relay with a tiny sensor that automatically combines both positive battery terminals when a charging voltage over 13.3 volts is present The sensor draws 0.00025 amps, enough to be considered totally passive. Installation is easier than the big red switch. First, wire the house batteries strictly to the house, and wire the starting battery straight to the engine as if it was a car, keeping the systems separate. Install the combiner relay by connecting the house battery negative terminal to the engine block/common ground, and connecting each positive battery terminal to the two big high voltage terminals of the bottom of the relay. Then the relay's voltage sensor gets a single tiny wire to the common ground. Done. A small LED on the device shows you if it is combined or not. It clicked right on today when the sun came up on the solar panels, and clicked back off when the sun went down. Same story when we start the engine and the alternator starts churning out the charging power. Awesome. The relay also has two other tiny terminals on the top that will prove useful. One is a remote control terminal that allows you to wire a single pole double throw (SPDT) on-off-on switch to toggle the remote wire between + and -, allowing "Always on/combined" (+) "Voltage sensing" ("off") and Always off/de-combined (-), allowing you to take care of those emergency situations with the flip of a small toggle switch, and leaving our power panel free of the big ugly red switch. Thanks for this write up, good info! I'm going to be installing solar on my sailboat soon. What charge controller did you get? It is a 15 amp charger from Hong Kong that I bought for about $100 on eBay. A quick eBay search and you should be able to find the same thing by the pictures. It is very nice, but with our two panels, we are already maxing its capabilities and will need to upgrade if we add any more panels.